Mui Ne, a Hidden Gem in Vietnam: 5 Ways to Spice your Life. Mui Ne is a coastal resort town in South East Vietnam, 4 hours drive from Ho Chi Minh City. Easiest way to get there is to fly to Ho Chi Minh City and grab an open tourist bus for $6 USD or a taxi for $70-100 USD. Our friends at Asia Travel Exclusives had a chance to explore and find some of the cooler things to do in Nge Mui, Vietnam. Mui Ne is a coastal resort town in South East Vietnam, a mere 4 hours drive from Ho Chi Minh City. 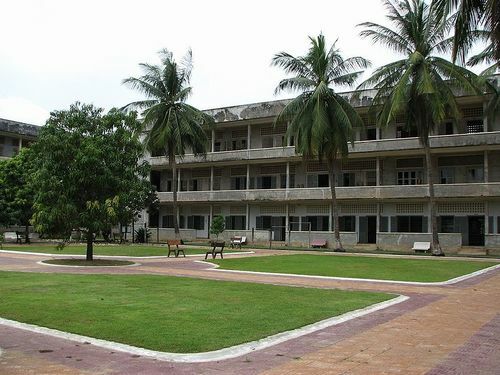 The town is close to the city of Phan Thiet, both of which are in Binh Tuan Province. Mui Ne has many resorts on the beach, as well as restaurants, bars and cafes. The beaches at Mui Ne is one of the Vietnam’s best kept secrets. Be one of the first to experience the country’s resorts, which are just a stone’s throw away from Ho Chi Minh City. These are poised to rival the more renowned beach destinations in South East Asia. This is definitely a side of Vietnam that is unknown to almost all overseas tourists. A hightlight to your trip to Mui Ne, the sand dunes are definitely a highlight not be missed, when visiting the province of Phan Thiet. Like a mini Sahara desert of sorts, the best way to explore them is via a quad bike or a 4-wheel drive. 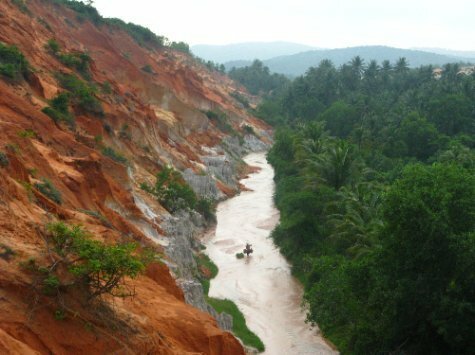 Located close to the famous sand dunes of Mui Ne, the spring flows through sand dunes and rock formations. The stream leads from the sea through to its source near the dunes. For the adventurous, Mui Ne is one of the best spots for Kite and Wind Surfing not only Vietnam, but across South East Asia with its strong winds. There are many schools along the beach to teach beginners the basics before they embark on the time of their lives. ‘Viet Nam’s Best and Most Challenging Golf Course’, by Viet Nam Golf Magazine in 2009. Visitors to Mui Ne can choose from a wide rage of international standard accommodation options. These range include Sea Links Beach Hotel or for more exclusivity, the Sea Links Beach Villas. Feel free to browse these hotels on Agoda. This entry was posted in Travel Agency, Uncategorized on March 27, 2012 by Flocations. Vietnam’s beaches at Danang, Hoi An, Nha Trang, and Phu Quoc Island are one of the Asia’s best kept secrets. Be one of the first to experience the country’s resorts that are poised to rival the more renowned establishments in Bali, Boracay, Krabi, Koh Samui, and Phuket. This is definitely a side of Vietnam that is unknown to almost all overseas tourists. 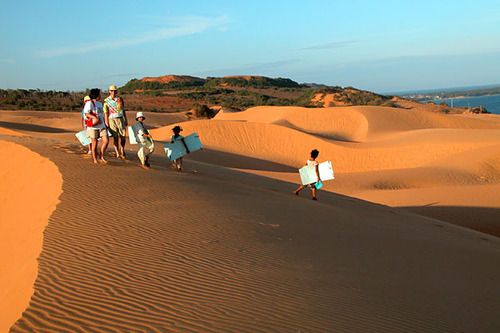 The sand dunes of Mui Ne is definitely a highlight not be missed, when visiting the province of Phan Thiet. Like a mini Sahara desert of sorts, the best way. Vietnam’s take of the infamous Alcatraz prison, Con Dao, is just off Ho Chi Minh City and is easily accessible via place. A visit to this island paradise, though might not reveal Con Son’s storied past… That it was once hell on earth for the thousands of prisoners during the French and American regimes. The island is best known now for its lovely beaches, coral reefs and scenic bays, and its very growing popularity has seen it gain media coverage from as far away as the New York Times. Situated in the Gulf of Tonkin is Halong Bay, one of UNESCO’s World Heritage sites. Halong Bay has 1,600 islands and islets. forming a spectacular seascape of limestone pillars. Located off Hanoi, one can spend one or two nights at Halong Bay on one of the traditionally authentic junks. The tunnels of Cu Chi are an immense network of connecting underground tunnels located in the Chu Chi district of Ho Chi Minh City. They are part of a wider network of tunnels which connect most of the country. 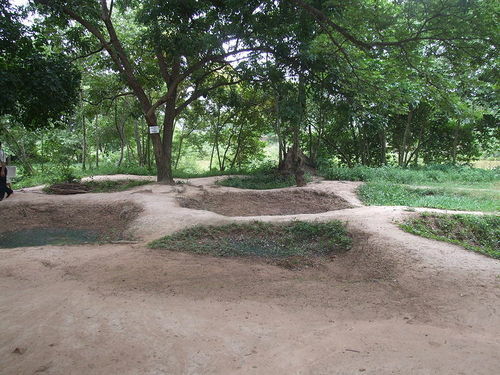 The Cu Chi tunnels were the location of several military campaigns during the Vietnam war, and are now used as a tourist attraction. After a day in tropical Vietnam, be pampered in heavenly bliss at one of the many top notch resort and city spas that will definitely smoothen your senses. Situated right in front of Ba Dinh square, this was what Ho Chi Minh had read the Vietnam Manifesto on 2nd September 1945. For all its rustic charm, Ho Chi Minh City and to a certain extend Hanoi have a comprehensive nightlife experience catering to both tourists and locals alike. This governmental building is significant in its role in the Vietnam conflict, and looks almost exactly like how it was in 1966. The view of rice terraces in Sapa is certainly a scenery to behold in all its beauty and greenery. Great snippets! If you’re interested, they have a free ebook that they send out weekly on interesting places to travel to in SouthEast Asia! Check them out. Also, feel free to check out the Cheap Flights From Singapore to Ho Chi Minh this weekend. This entry was posted in Uncategorized on March 22, 2012 by Flocations. Wah, EXTREME RATE! I think I will close shop on 4th of May and show up at JFDI, see if anyone wants to buy Flocation shares. If not, I will offer them S$1,000 for 5% and if they want to counter offer, maybe I will also throw in lifetime supply of fresh vegetables lah. Steady bom pi pi! Silicon Straits did a wonderful piece on us that I could hardly comprehend. Apparently, Google translate does not do Hokkien so I had to ask a few people to interpret and the news is good! Silicon Straits has just made an investment counter-offer to Angel’s Gate with an attached 1.6M valuation… plus we get free vegetables for a lifetime! Our value is proven one more time… now with free veggies for life!!! The team is very excited as we are all starting to develop a rare form of nerd scurvy and we can’t afford to lose any more teeth. For the lifetime supply of vegetables Silicon Straits has offered, it would amount to $1/day per person and would accumulate to $4/day to support the founding team. We are around 30years old, hence we still have around 55 years to live so 55 is now defined as our “lifetime”. at 5% that’s a 1.6M valuation!!! Thanks for boosting our Valuation, Silicon Straits, the team cordially accepts your offer and are eagerly anticipating their daily ration of fruit. This entry was posted in Uncategorized and tagged press on March 15, 2012 by Flocations. Well there you have it! Flocations has made headlines once again by saying “No” to $250,000 dollars. ”YOU GUYS ARE A CRAZY!” some may say, but we see it otherwise! Commentary at the bottom. Right now, here are some of the news we made . This is the actual show that was televised on Channel News Asia on March 12th, 2012. In this clip, the Florian and Tudor discuss some of their “feelings” around what happened, what they’re going to be doing and selflessly promoting Google products. Some generated press from the local tech community. We’ve worked on our company for almost a year, spending hours agonizing over the numbers and producing the best code. Why would we only take 15 seconds to make a decision that signs away a third of our company? Even before we tried to rebut the offer, the Angel said “you have 15 seconds to decide, go!”. 15 seconds!? To make a decision this big!? I think we wasted 5 seconds trying to compute the situation. So thanks to everyone supporting our 4 cofounders that are busily working to get a product out the door. We really loved the Angel’s Gate experience and encourage any entrepreneur to try out for it. This entry was posted in Uncategorized on March 14, 2012 by Flocations. Flocations will be featured on the next episode of Angel’s Gate Television Show (TONIGHT!). The founders, Tudor and Florian will look like complete asses getting shot down by the Angels. It should be good fun seeing them squirm. Make sure to catch Episode 6 on Monday March 12th at 8PM Singapore Time on Channel News Asia! Here’s a sample for Episode1. Also, for the sake of Charity, please go to our Angel’s Gate website and for every Like we get on that site, $1 will go towards a local children’s charity! Several months ago we applied to be on the televised investment program called Angel’s Gate. Very similar to UK’s Shark Tank and Canada’s Dragon’s Den, however, Angel’s Gate concentrates more on Angel investing in the technology sector, something very suited for our budding travel discovery startup. After several try outs, filming our pitch, meeting with organizers, and several rehearsals, our show was finally aired on March12th at 8pm on Chanel News Asia. You should be able to see the show on Youtube (http://www.youtube.com/user/AngelsGate) within a few days after airing and we will be sure to tweet about it @flocations (http://www.twitter.com/flocations) and also on our facebook (http://www.facebook.com/flocations) and blog.flocations.com. This entry was posted in Uncategorized on March 12, 2012 by Flocations. During our time in the JFDI Global Accelerator Network, we come across some amazing things. This one is quite interesting as Facebook believes that there are more Lesbian Women in SouthEast Asia than Straight women. I’m not an anthropologist but common sense dictates that these results may be false. Facebook has some very powerful targeting tools to target ads by age, gender, likes, dislikes, friends, associations, interestests, etc. Basically using Facebook Ads, I can target an advertisement so damn specific to you, that the one “like” that you had for that Rick Aistly video will be forever in their system. That’s why you keep getting Aistly’s “All Time Hits” album as a Facebook Ad. Recently we have been doing some tests to target Women in Singapore. During our testing we saw that Women interested in Women within Singapore has a 2x greater share on Facebook than Women interested in Men. Hmmm, common sense says this is False. America: common sense works here; the straight variety out numbers the gay variety by 10x, something expected. Closer to Singapore, Malaysia: Voila, Lesbian women outshine Straight women by a factor of 8. Well, it seems that there is definitively a cultural divide. The current language that Facebook uses to ask your sexual preference is misconstrued and not taken in its proper intended context within Asia. Well, can you depend on Facebook’s targeting specifics, created for a North American audience, to market properly in Asia? Something as nominal as a question regarding someone’s sexual preference should be rather simple to ask, so how do we know our marketing dollars are going to the right audience? For all I know, when I target 30-50 year old travellers, I could be marketing to 16-24 year old Rick Aistly subscribers. And before you ask, Indonesia is the 2nd largest Facebook population, so yes, this is relevant! Let’s get some REAL localization here Facebook! This entry was posted in Uncategorized on March 2, 2012 by Flocations. The Flocations team met Rowan at the JFDI incubator. Being a mentor and a fellow traveller, we have asked Rowan for an interview to enlighten everyone about his latest travel to Cambodia! Here’s Rowan turning the tables on an unsuspecting spider. Flocations: Let’s have it; overview of your trip! 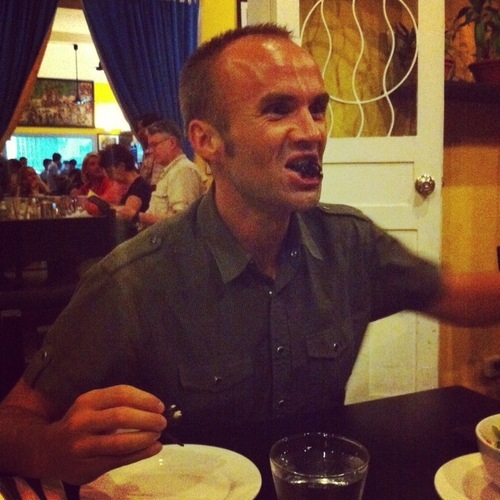 Rowan Simpson: I was in Phnom Penh, Cambodia for a weekend, flying in from Singapore on Friday evening and back on Sunday evening. I was lucky to be looked after by a friend from New Zealand who is currently living and working there. Because of the limited time it was a bit of a rush to catch up with them and also see some of the sights, but I managed to squeeze a lot into a short visit. Flocations: What was your favourite sight? Rowan Simpson: Perhaps “favourite” is not the right word, but I definitely recommend a visit to Choeung Ek (aka The Killing Fields) http://en.wikipedia.org/wiki/Choeung_Ek and Tuol Sleng Detention Centre (now the Genocide Museum) http://en.wikipedia.org/wiki/Tuol_Sleng_Genocide_Museum in the city. It’s chilling to visit places where only 30 years ago some pretty horrible things took place, and to learn more of the history and reflect on the events that lead to that happening. If you need to let off some aggression after that, there is a shooting range on the way back into the city where you can try out a wide range of semi-automatic weapons. After trying that I decided I would make a pretty hopeless terrorist/freedom fighter. Flocations: What did you find most shocking/interesting? Rowan Simpson: After spending a few weeks in Singapore the thing that slaps you in the face as soon as you leave the airportis the noise and chaos, as tuk-tuks fly in all directions, dust is kicked up from the roads and sidewalks and there are people everywhere. I was also interested to see how they operate a dual currency – with prices quoted in both Cambodian Reals and US Dollars. It’s not unusual to pay in US Dollars and receive change in local currency. The on-the-fly exchange rate calculations are a normal part of the retail experience. Flocations: What would you do differently if you were to go back? Rowan Simpson: Spend more time there, obviously. And get out of the city and explore Siam Riep and other more remote parts of the country. This trip has definitely whetted my appetite for a return visit sometime soon. Flocations: What was the best dish you ate? 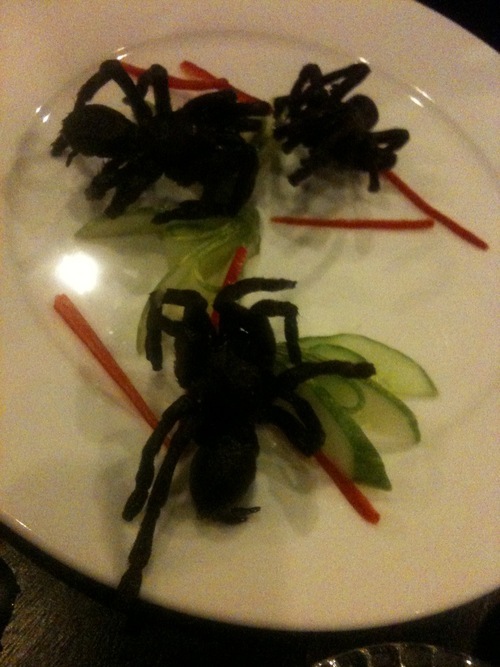 Rowan Simpson: Again, I’m not sure that “best” is the appropriate word, but the crunchy plate of tarantulas we were served on Friday evening is definitely the food that will stick in my memory. Something to try once and then talk about forever. It was an excellent meal at a training restaurant run by/for an orphan charity (all of the staff are orphans which the organisation has assisted). Flocations: what advice would you give travellers traveling there? Rowan Simpson: Find a tuk-tuk driver who you trust and get them to look after you for the time you are there. It’s embarrassing how little these guys cost and it’s great to buzz from place to place in an open air vehicle and soak up the sights and sounds (and smells!) en route. As them to take you somewhere off the beaten track – that’s always where the most interesting things are. I can also recommend the Quay Hotel on Sisowath Quay – a clean, inexpensive and modern place right on the river. I would definitely stay there again. Thanks a bunch for the interview, Rowan! If you want to find out more about Rowan, make sure to follow him on twitter or check out his blog! Also, if you are interested in heading to Cambodia, check out our other blog post about getting your Cambodian Visa Online! This entry was posted in Uncategorized on March 1, 2012 by Flocations.